Archdiocesan seminarian Charlie Wessel stood on the stage at the front of a quarter-mile long cavernous hall in the Indiana Convention Center in Indianapolis and looked out at a sea of 17,000 young people prepared to worship together in a celebration of the Eucharist. 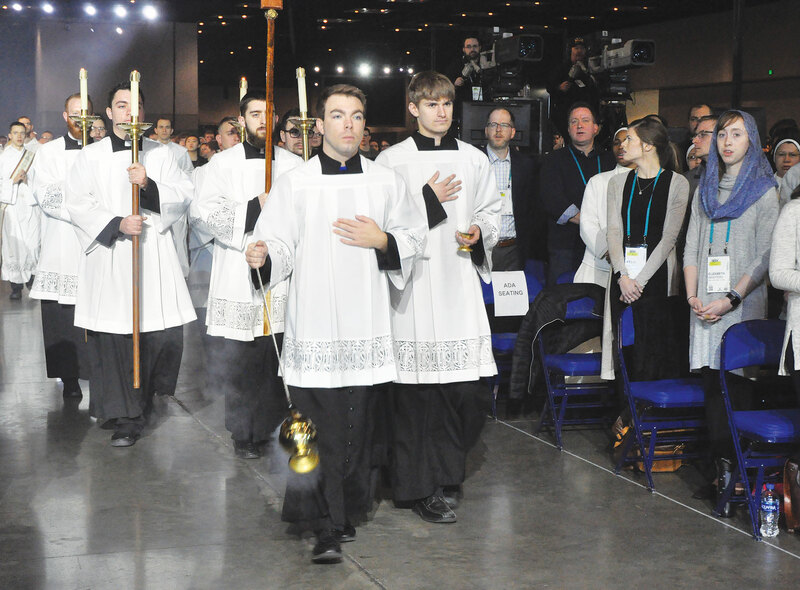 It was the opening Mass of SEEK2019 on Jan. 3, a biennial conference sponsored by the Denver‑based Fellowship of Catholic University Students (FOCUS), and Wessel was an altar server during the liturgy. The moment humbled Wessel, a senior at Bishop Simon Bruté College Seminary and a member of St. Simon the Apostle Parish, both in Indianapolis. Wessel was one among nearly 300 seminarians from across the country to attend SEEK. “On the one hand, the participants in SEEK are the peers of a lot of our seminarians—similar in age and situation,” he said. “And so our seminarians are able to be there as a part of a peer group that are all trying to seek Christ, to grow in their faith and to discern their call. Attending SEEK reminded Wessel of the importance of living out the faith he is called to offer other young adults. At the same time, the conference encouraged seminarians from across the country in their priestly formation. In 2016, archdiocesan seminarian Bobby Vogel was inspired at a FOCUS conference to open his heart to a possible call to the priesthood. Three years later, including two spent as a FOCUS missionary at Eastern Michigan University, Vogel has entered priestly formation and assisted at all the liturgies during SEEK in Indianapolis. Like Vogel, Joe Culligan, a seminarian for the Diocese of LaCrosse, Wis., was previously a FOCUS missionary. His experience of helping college students enter more deeply into the Catholic faith helped him discern a possible call to the priesthood. He added that SEEK had been “monumental” in his discernment. Like Wessel, Isaac Doucette, a seminarian for the Diocese of Davenport, Iowa, was present at SEEK’s opening Mass. While SEEK’s opening Mass was occurring in Indianapolis, the bishops of the U.S. were gathered on retreat about four hours away where Doucette receives his priestly formation—Mundelein Seminary at the University of St. Mary of the Lake in Illinois near Chicago. The reality of the current clergy sexual abuse crisis in the Church gave Doucette an added motivation to attend SEEK. Standing on the stage during SEEK’s opening Mass along with Wessel, archdiocesan seminarian James “JJ” Huber also found hope for the Church, despite the challenges it is facing.